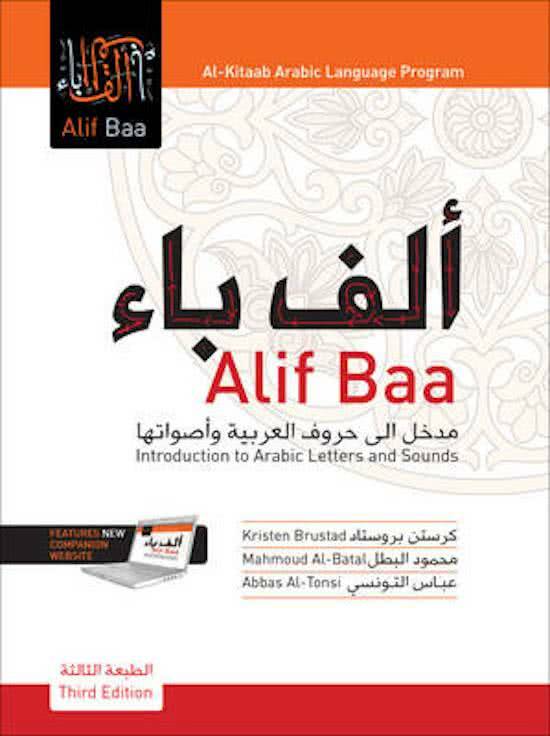 In this review I will give my perspective on Alif Baa: Introduction to Arabic Letters and Sounds (ألف باء: مدخل إلى حروف العربية وأصواتها), a popular textbook by Kristen Brustad, Mahmoud Al-Batal, and Abbas Al-Tonsi. The book comes with a CD full of audio material. Access to a companion website with video material can be purchased separately. As the title suggests, the main focus of this book the alphabet, but it also has some other interesting features. This book is actually the introductory volume to the Al-Kitaab series, which are probably the most widely used textbooks used in American university courses. The whole series, including Alif Baa, was designed for classroom use, but this review is more geared towards independent learners. I have taught several courses using this book. Structure. The book is divided into ten units, each of which introduces several letters and symbols, with explanatory text, examples, exercises, and cultural notes. Standard Arabic and dialect side by side. One of the first questions to ask when evaluating an Arabic textbook is what kind of Arabic it teaches. Alif Baa takes a unique approach to this question. While the reading and writing portion focuses on (somewhat informal) Standard Arabic, the vocabulary sections present three different varieties: Standard Arabic (labeled “formal/written”), Egyptian dialect, and Levantine dialect. This gets you used to the idea right from the start that “knowing Arabic” entails knowing not only Standard Arabic for reading and writing, but also some modern dialect for spontaneous communication. The three varieties are presented as columns in a table, so you can also a feel for how similar they are to one another. Good exercises. The exercises in this book are nicely varied and plentiful: letter connection, reading, dictation, sound discrimination, and others. Big print, writing space for practice. Examples and writing models are presented in very large, readable print, often with handy little arrows to indicate the direction of writing. Alif Baa is both a textbook and a workbook. The writing exercises provide plenty of space for you to practice writing right in the book. Its large format and the way that it lies nicely flat make it easy to write in (the glossy paper somewhat less so, however). Colorful and attractive. No one could deny that this is an attractive, colorful book. Color is used to full effect throughout, with specific letters or symbols in individual words often highlighted by using a different color of ink. There are many illustrations and photos, usually related to a cultural note or a word or letter that has just been introduced. Cultural notes. Many lessons include a useful cultural note. Topics include “At the coffee house”, “Guests’ and hosts’ roles”, and “Development of the Arabic writing system”. By contrast, my own book, Bite-Size Arabic: Learn to Read and Write Arabic Using the Tiniest Bit of Vocabulary and Grammar costs only $25. The companion website with audio material is open and free, and the companion handwriting workbook can be downloaded as a PDF free of charge. What am I supposed to do with this vocabulary? Each unit in the book introduces not only new letters and symbols, but also roughly 20 vocabulary items. This is presented in a three-dialect table as described above. But what is the student supposed to do with these words? There is no guidance as how to make sentences with them. For example, unit 6 includes the words for ‘ready’, ‘coffee’, ‘milk’, ‘sugar’, ‘I go’, and ‘he goes’, but there is no indication of how to use these in sentences. A good teacher would be able to devise ways to activate this vocabulary in the classroom, but that seems like poor design on the part of the authors, and it is of no help to the independent learner who has nothing to rely on than the book. The CD medium. The book comes with a CD with audio material. This is great, but I am discovering in my classes that many people no longer have easy access to a CD player. While Alif Baa does have a companion website, access costs $25 (and I’m not even sure if the website includes the material on the CD). Appropriate for the independent learner? This book really isn’t designed for the independent learner, but rather for a classroom student as preparation for the Al-Kitaab series. That’s not to say that you can’t work through the book on your own, though. If you do plan on using this book independently, I suggest you fork out the additional $7 for the answer key booklet. All-in-all, this is an attractive book that pleasant to work with. Drawbacks include a very high price, the need to purchase a separate answer key, too much emphasis on individual words out of context, and poor integration of vocabulary. However, some learners will find this a good book to learn to read and write Arabic. I do recommend learning to read and write Arabic before working through a more general textbook such as Mastering Arabic 1 or Complete Arabic, because those books really don’t give you sufficient grounding in the alphabet, especially with respect to writing (even though they contain lots of writing exercises). The two books I recommend for learning the writing system are Alif Baa, reviewed in this article, and my own book, Bite-Size Arabic: Learn to Read and Write Arabic Using the Tiniest Bit of Vocabulary and Grammar.